An Open Research Notebook Workflow with Scrivener and Github Part 2: Now With Dillinger.io! 5. and then reconvert to rtf for syncing back into Scrivener. I wondered to myself, what about some of the online markdown editors? Dillinger.io can scan Dropbox for md files. So, I went to Dillinger.io, linked it to my dropbox, scanned for md files, and lo! I found my project notes. 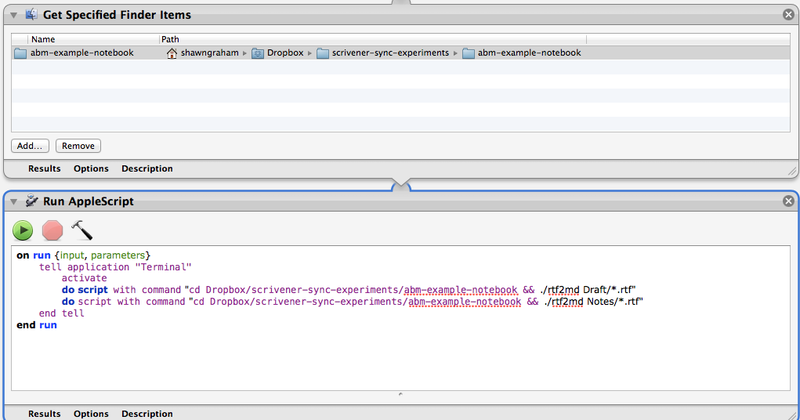 So if the syncing folder is shared with other users, they can edit the notecards via Dillinger. Cool, eh? Not everyone has a native app for editing, so they can just point their browser’s device to the website. I’m sure there are more options out there. I was getting syncing errors because I wasn’t flipping the md back to rtf. But, one caveat: when I went to run the md to rtf script, to get my changes back into Scrivener (and then sync), things seemed to go very wonky indeed. One card was now blank, the others were all Scrivener’s markup but Scrivener wasn’t recognizing it. So I think the problem is me doing things out of order. I continue to play. I automated running of the conversion scripts. You can see my automator set up in the screenshot below. Again, I saved it as an application on my desktop. First step is to grab the right folder. Second, to open the terminal, input the commands, then close the terminal. I was asked why on earth would I want to share my research notes? Many many reasons – see Caleb McDaniel’s post, for instance – but one other feature is that, because I’m doing this on Github, a person could fork (copy) my entire research archive. They could then use it to build upon. Github keeps track of who forks what, so forking becomes a kind of mass citation and breadcrumb trail showing who had an idea first. Moreover, github code (or in this case, my research archive) can be archived on figshare too, thus giving it a unique DOI *and* proper digital archiving in multiple locations. Kinda neat, eh?